From our Unique Beaded Fringe Collection (trims under 1 1/2" long)Beautiful, shiny and fun this coin and beaded trim has it all. This style is available in several color combinations - so be sure to also look at our "Silver Coins on Black" and "Gold Coins on White ". All three colors of these coin trims make a fabulous sound when rustled. Think belly dancer and you are right on track. It's not just for belly dancercostumes though, it would be fabulous on your bag, jeans, tops or whatever. This trim will help you use your imagination! 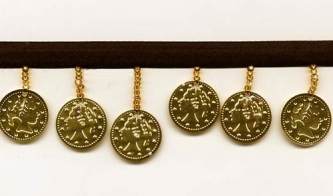 Gold coins and seed beads strands are 1 1/4" long not including the black satin ribbon.